I recently posted a picture of an embroidery I had been working on (the centre of the baby quilt with the Mother Teresa quote). A few people have asked how I traced the embroidery pattern onto the fabric. My technique is dead simple, but very effective. I have tried many methods using different tracing materials and I must have spent a fortune on all kinds of expensive fabric-tracing pens. Finally I found a method that produces consistently great results and all you need is a window, some sticky tape, and a $3 pen! Those of you who follow my Facebook page will know that I am currently embroidering Tasha Noel's 'Feeding the Chicks' pattern for her, as she needs a stitched example for her Etsy shop. 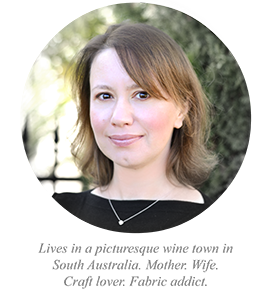 Tasha is one of my favourite bloggers and the designer of the Simple Life fabrics I raved about a while back. I thought I would use this as an opportunity to share my tracing method with you. STEP 1. 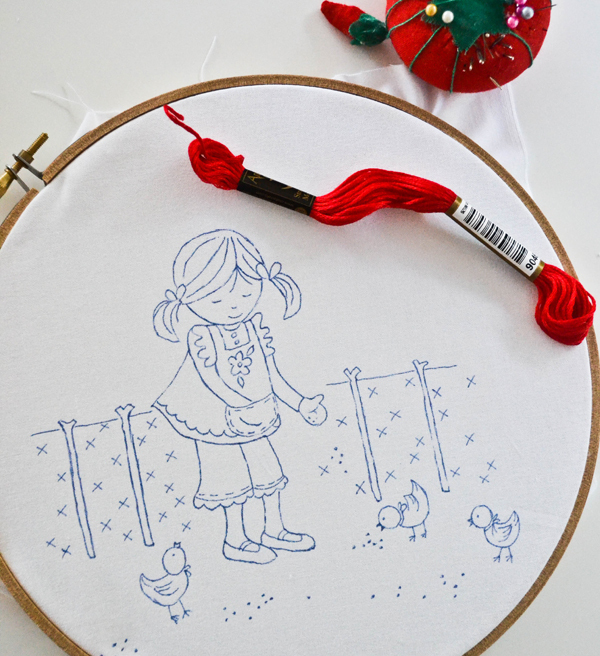 Print out the embroidery pattern and tape it on to your window. STEP 3. Grab your miracle pen! 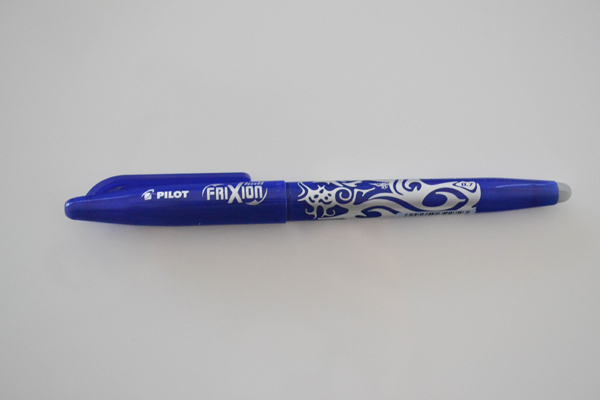 This is a children's stationery pen called Pilot Frixion and about $3 from the supermarket. I am pretty sure they are available not only in Australia but US and Europe too. It is the best invention ever, and SO much better than any other purpose-made fabric-marking pen out there (water soluble, air dissolving, chalk, I have tried them all). It's not only dirt cheap but also marks exactly like ballpoint (crisp and clear), but apply a bit of heat and it magically disappears, never to come back! Hence the name 'Frixion' - you can rub it on paper with the eraser on the back, which generates heat and removes the marks. So after finishing the embroidery you can iron / steam it, or even better, give it a quick blast with the hair-drier, and voila, all the pen marks are gone! STEP 4. Trace the pattern onto your fabric, holding the fabric nice and taut with your other hand. Your stitching is so neat . You use the same technique for tracing as I do exept I always forget to remove the sticky tape from the windows , lol ! Check in Coles or Woolworths. I get mine from my local Coles. I get mine from Officeworks. The best thing I have found is Trans-fer-Eze and it's found on Createforless.com. 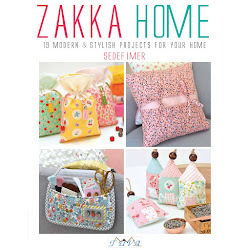 It's a film you can put in your printer and print the image on and then use for embroidery. I can't live without it. I love these pens! They are readily available in Canada at office supply stores such as Staples. Just found your blog thru craft gossip. Love your embroidery, am now following by email! Thank you for passing on the word about the pen. Will look for it next time i'm in Wal-mart, but in case they don't have it I have found it on E-bay. I was just about to start on an embroidery project and trying to decide the best way to trace. Thanks for the tip! This sounds marvelous! I had just once again bought myself a transfer pen hoping that this one might work properly. And again spent a lot of money. Therefore your information sounds just the right thing for me. I live in Germany and have actually found the pen online over here so I will buy one right away! Thank you so much. I am really looking forward to my next embroidery! Just found an article about you on Craft Gossip and had to visit. I've read so many articles about using this way or that for tracing a pattern. I like your style: keep it simple and inexpensive. I checked for the Frixion pen here in Oregon (U.S.) and it looks like Office Depot carries it. I'm going to check it out tomorrow. Thanks for the great information. Thank you so much for this, I'm so glad I found you! I was wondering how I could do this. I was using an air erasable pen and it was fading before I could finish. Have just ordered this pen now and am very excited to give it a try! Love your blog! I'm a bit confused. Help! You don't mention turning the tracing over, and I see that the picture you end up with is not a mirror image of the original. How come? Do you not need to turn the marked side down onto the fabric before ironing? Hi Lesley, I trace directly onto the 'right' side of the fabric I am going to embroider, and embroider over the trace lines directly. Then apply some heat (e.g. hair drier) and the trace marks disappear. No need to worry about mirror images or turning the fabric down. Hope this makes sense? Love the article - but you should know - the ink doesn't really go away. If the embroidered article gets cold (as if you stuck it in the fridge or freezer) the marks will come back. They'll go away with another application of heat - but depending on how you use or mount your embroidery, that is not always possible. Quilters have run into this already, by using the pen the mark quilting lines - the marks return if the quilt gets cold. Thought you should know. I luv your tutorial how can I follow you or subscribe? Thank you so much. I tried this today and it worked very well indeed. hi!! I love that pen too!! It is the best invention ever!!!! Would love to buy this pattern. It reminds me of my granddaughter - she loves feeding the chickens when she visits. I checked Etsy but couldn't find it. Can you help?